Sometimes, even after gaining hard-earned reputations, legendary brands quietly fade away. 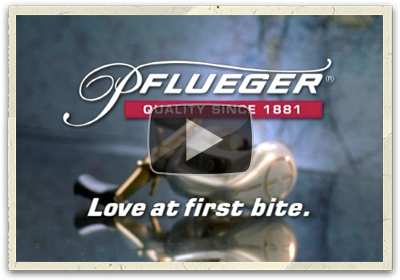 Shakespeare Fishing Tackle (makers of the Ugly Stik) decided to re-launch a classic name from the past – Pflueger. At one time the choice of serious fisherman, Pflueger rods and reels literally disappeared from the marketplace for many years. Our challenge: re-establish the legendary line as a premium alternative for young fishermen ready to trade up. We re-created a shopping reality: the legendary, fluid feel of a Pflueger reel immediately captivates any hand that picks it up. In our commercial, a cautious young fisherman – checking out price tags – tries his first Pflueger reel and falls in love. The resulting daydream includes a monster fish and a cameo by nationally-known, multiple-award-winning fishing legend Mark Davis. It was an appropriate connection – a new legend re-introduces an old one.